In the name of all the believers of Lithuania I thank you for Your visit. We have been waiting for this meeting very much! I believe that it will be an act of mercy that will remain in our hearts and that will make the Gospel of Christ in our hearts even more alive. After having received Baptism more than six centuries ago, Lithuanians have always been united to the Bishop of Rome as to their chief Shepherd. In this square Pope Saint John Paul II prayed 25 years ago. His visit was immensely meaningful for us in those years of rebirth, when after the occupation and the atheistic regime we tried to rise again, and we looked for the road of freedom. The spirit of rebirth is also necessary today. Holy Father, You have come to Lithuania, the place that seems only to be a small country at the edge of Europe. Holy Father, as you constantly visit those people who are at the peripheries, the weak and small, You show that happiness doesn’t depend on geographical place and that God, in His affectionate love, embraces each one; and that the only center is Christ, because when we are with Him, we have hope, and we have the future. Jesus Christ is our hope. We want to live this message, and we want to share it with everyonr. 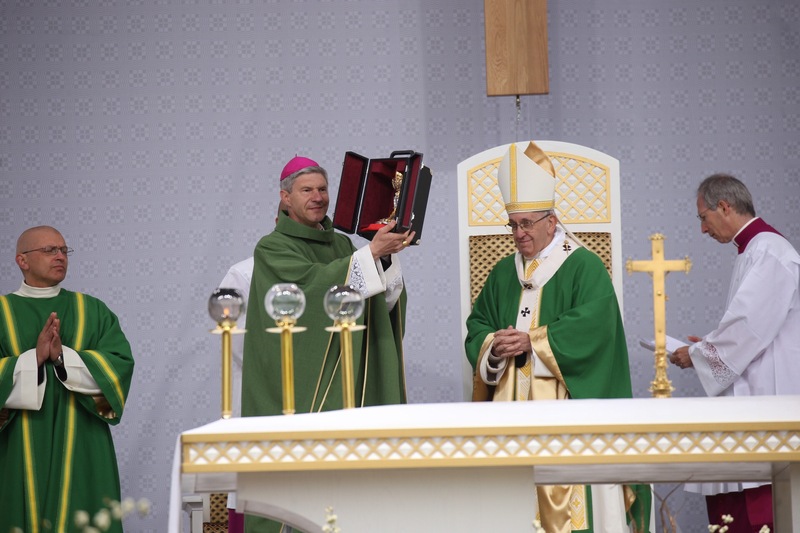 Your visit encourages us Lithuanian Catholics to announce the light of the Gospel with audacity, to take care of families, to speak to the hearts of young people, to be close to all those who look not only for the bread but also for justice and hope. Before departing you visited the Virgin Mary, the patroness of Rome. In Lithuania we also revere the Mother of God from all our heart. To the sanctuaries such as Šiluva, Aušros Vartai, Žemaičių Kalvariją and other, a many believers hasten to bring the joys, worries and pains of their lives, and they pray with trust knowing they will be listened to. We submit Your visit to Blessed Mary, and we promise to accompany You as a Church leader with our prayers. Holy Father, please bless all of us, who have come here. Let this blessing reach all Lithuanian children in their Motherland and everyone throughout the world.